While on the rise to anthem status, “Alright” has served as a catalyst to rejuvenate the morale of those who have felt the disparaging outlook of minorities in this country. Although considered one of the more upbeat tracks on Kendrick’s latest body of work, “Alright” explores a slew of melancholic themes laced with moments of genuine hopefulness. This volatile mixture creates the most visceral of reactions, that are as cacophonous as they are symphonic. Somewhere within the intensity of his vocal delivery, the meticulousness of his wordplay, and between the layers of Jazz, Motown and Hip Hop there is a foundation of honesty entrenched in his work. It is this honesty that allows us to trust and respect his art. 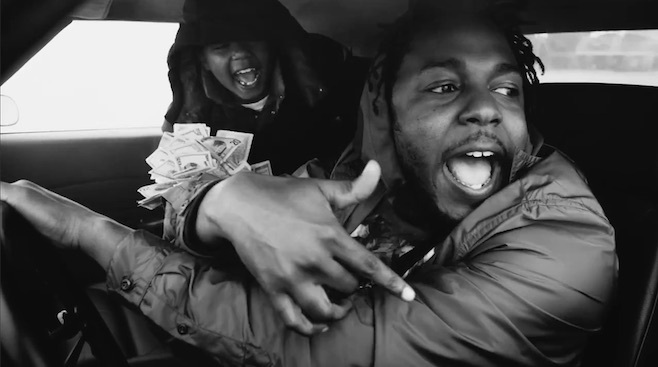 As a master storyteller, Kendrick conjures explicit imagery with every word. “Alright” mirrors the layered experience of being human, and heavily combats the notion of respectability politics. From the opening stanza you get a dose of raw intensity. It’s almost as if his voice reaches in and jacks up your soul. It’s as if he’s calling you out on your audacity to do anything other than believe in yourself. He reassures you that we’re all “fucked up” and reminds us that our redemption cannot be found within another person. Kendrick openly allows us to get a peek at his vices while also showing us the work he puts in to reach deeper and cultivate his purpose. One of the main themes of the song is that the quest for growth is far from straightforward and is filled with pitfalls. Those pitfalls, however, must never make us feel unworthy or undeserving of the good things in life or, more importantly, life itself. The number of senseless deaths that we have been forced to face this summer has been nauseating. From Charleston, to Waller, to Chattanooga and to Lafayette, 18 lives (including two of the perpetrators) have been taken under different circumstances. Part of the reasoning for each death endured was the same: the disregard for human life. While blood seeped into the floor beneath pews, while strange fruit hung from a jail cell ceiling, while laughter turned into nightmares at a theater, and while bravery withstood its final test at a base, the world still subjectively calculated the value of each life. This is the reason this song exists. Some of the lines compare to one of the events that transpired. I’m caught between thinking this song was an act of foreshadowing or déjà vu. “When our pride was low, looking at the world like where do we go. . .I’m at the preacher’s door, my knees gettin’ weak and my gun might blow” floored me after hearing about the Charleston shooting. There are no words to describe how it feels to realize that a place you may go for sanctuary and solace is no longer a place where you can be at ease. How do you describe how it feels to know that there is no space where your aren’t seen as a threat? The last two stanzas of “Alright” sum up the piece nicely and gives you further context in terms of how this song fits in the overarching story of the album. Every day is a new opportunity for change, and unfortunately every change isn’t a good change. Don’t let that knowledge make you fearful. Sometimes, when we get caught up in this web of life, loving ourselves and others can become complicated, but that does not mean that it is impossible. There will be times where we feel confused, disgusted and hopeless, and there will be times when we abuse our power. Though we may feel the weight of resentment, we must remember that realizing where we falter is the only way that we can improve. Despite the pressure, we must remain resilient. If you didn’t think that the content of the lyrics to this song was enough, or if you’ve had ‘To Pimp a Butterfly’ on rotation a little too heavily, take a look at the official video and BET performance. Just be prepared to possibly go into imagery overload. Both the music video and live performance of this song provided arresting visuals (no pun intended) that intensified the symbolism of this song. These performances make the song even more electrifying and leaving you feeling charged up. In fact, it’s starting to become a rallying chant of hope. Recently, Yasiin Bey, aka Mos Def, came to the stage with Kendrick at the Osheaga Music festival and remixed the chorus saying “We’re already alright”, which only strengthened the song’s bite. So keep pushing for answers, and don’t allow the pressures of society make you self-destruct. ‘Cause we gonna be alright. Did you like this review? What songs would you like to see reviewed? Leave a comment below. Great Blog…One of my Anthems. Thanks for the love 🙂 I’m glad you enjoyed it. It’s definitely one of mine too.